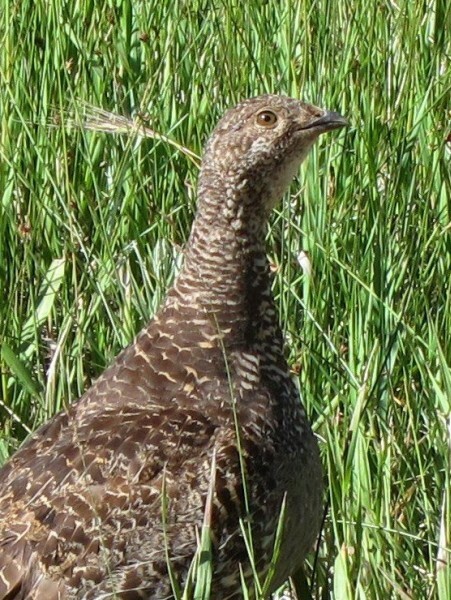 “Grrruuuuk, guk, guk, guk, guk,” said the momma Dusky Grouse to me. The hen was “grousing” about my presence in her berry patch and was clucking to her half-grown summer chicks. They stepped crisply into the brush and disappeared completely from view even as the adult bird hopped up onto a boulder to act as sentinel. Called “fool hens” by settlers, it is exactly this behavior of the adult birds that made them easy targets. Unlike turkeys–and pretty much anything else–it is pretty easy to approach a sentinel bird, especially in late Summer or early Fall when coveys are family groups. The hen kept clucking, but didn’t leave her post even as I moved slowly to within twenty feet of her. Eventually she flew down into the brush, but only after the chicks had long gone from view. 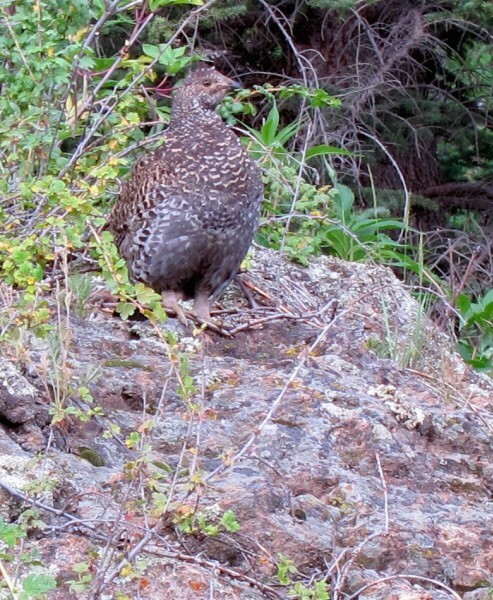 Dusky Grouse (Dendragapus obscurus) are native to the Rocky Mountains and the only mountain grouse in New Mexico. Until 2006, they were lumped with the blacker Sooty Grouse of the Pacific coast and together known as Blue Grouse. DNA studies now suggest they are actually distinct species although they are very similar in behavior and other characteristics. They are the third largest of the grouse family–about the size and shape of Bantam hens, and have much the same upright posture and deliberate, head-bobbing walk. Their beautifully patterned, blue-gray plumage makes them nearly impossible to spot unless they move or cluck. When startled, they can fly but seem to prefer to run for cover–they are much stronger runners than flyers. Courtship displays by the males are a series of low, almost inaudible (to human ears) hoots made with a flared tail and brightly-colored, naked neck patches like retractable billboards advertising the male’s finer qualities. (See a short, excellent youtube flick of the related “sooty” male courtship display HERE.) After mating, the males no longer keep the company of the hens who scrape a shallow nest on the ground, lay and hatch out 4-9 eggs. Like chickens and other “precocious” birds, the hen doesn’t feed the chicks which are born fuzzy and scamper around on their own within minutes of hatching. Grouse eat lots of insects as chicks, but their adult diet favors berries and a surprising amount of conifer buds and needles. Grouse are usually found at lower elevation during mating and nesting season, then travel up into higher country during the Winter. Mixed conifer woods near stream side vegetation or meadows where there are lots of food choices are good places for seeing grouse. I would wager money that most hikers never see these birds even though they are relatively plentiful. They don’t like company, shun most trafficked areas, and blend in with their surroundings so well that it is easy to walk by unless listening for the tell-tale “grousing”. If you walk slowly and quietly in grouse country, though, perhaps you’ll be lucky enough for your own encounter with a “fool hen”. This entry was posted in Critters, Flowers&Fauna. Bookmark the permalink. You know, KD, this blog is really therapeutic for someone who’s stuck indoors for the day, and inspirational for people who might need a little nudge to break out of such a rot. Love the natural history pieces. Thanks Truchacabra! It’s great fun really. And a very good excuse for sharing some of the photos I’ve taken which otherwise might molder away somewhere.